Mayor Martin J. Walsh chose the Conte Forum at Boston College so that he could invite a larger audience to his inauguration. They came from across the city, across the pond, and across the aisle politically. They came from the halls of power on Beacon Hill and the halls of political infamy. 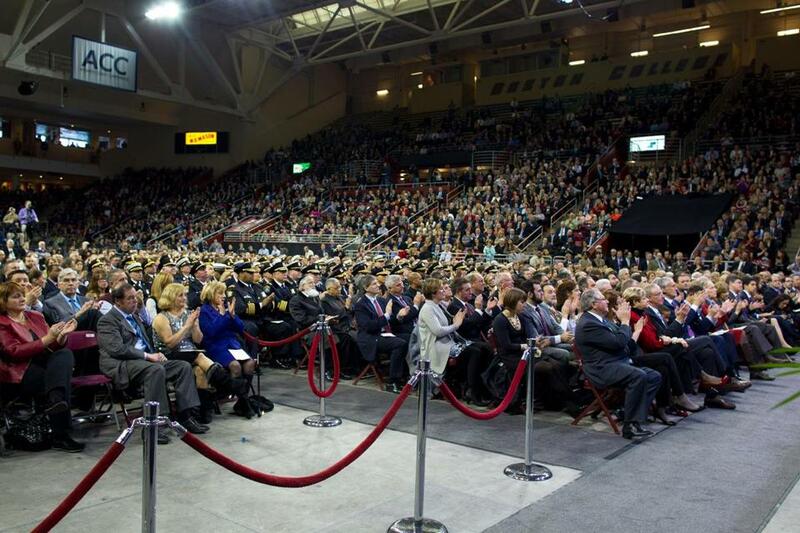 Nearly 8,000 people turned out at Boston College’s Conte Forum Monday morning to watch their unassuming friend and neighbor, Martin J. Walsh, become Boston’s new mayor. “He’s so real,” marveled Kelly Butts, a fellow Dorchester resident who was thrilled to see “such a normal, average person up there.” She brought her husband and 12-year-old son, Robert, to witness the festivities that she had worked so hard for during the campaign. 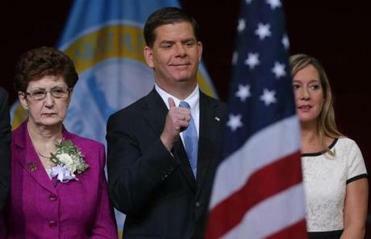 For years, mayoral inaugurations have been held in downtown Boston, but Walsh’s committee moved the event to Boston College, his alma mater, hoping to invite into the larger venue many of the thousands of campaign volunteers who helped make it happen. The crowd included many who know Walsh personally, from his old friend Martin Tierney, the Irish-born, 75-year-old retired bartender, to Dominique Donna, who helped Walsh campaign in the Haitian community. As the son of Irish immigrants, Walsh attracted to his inauguration the mayors of both the city and county of Galway. “This is a hugely historic occasion for Boston, and this is a hugely historic occasion for the people of County Galway,” said Mayor Liam Carroll of County Galway. Nearly all the mayoral hopefuls who lost to Walsh showed up, including his general election rival, John Connolly, as well as preliminary contenders Felix Arroyo, Rob Consalvo, Dan Conley, Charlotte Golar Richie, Mike Ross, and Bill Walczak. Another mayoral contender, Charles C. Yancey, was onstage with the rest of the City Council, whom Walsh swore into office soon after he took the oath. Walsh, a former head of the Boston Building Trades Council, also attracted labor leaders, including Massachusetts AFL-CIO president Steven A. Tolman, and Edward A. Kelly, president of the Professional Fire Fighters of Massachusetts. It was a who’s who of Democratic power brokers. But it even drew some prominent Republicans. Charlie Baker, a Republican candidate for governor, and his running mate, Karyn Polito, were there along with the former chairwoman of the Massachusetts Republican Party, Jennifer Nassour. “I think he’s going to take the city in a good, fresh direction,” said Nassour, a Boston resident. There was, of course, one glaring absence. Former mayor Thomas M. Menino declined to attend, heading off for vacation instead. Many others in the crowd were friends or neighbors of Walsh’s from Dorchester. “It was moving — I got a little emotional,” said Dennis Walsh, a Dorchester utility worker who is friends with the mayor, but not related to him. A volunteer who works as a mentor and to help the disabled, he hopes Walsh’s spirit of giving inspires others to do the same. “If everything could happen like Marty’s saying it’s going to, it’ll be a much better place,” he said. globe.com. Follow her on Twitter @StephanieEbbert.